This, ladies and gents, is the most expensive ice-cream of our lives. €15 each! 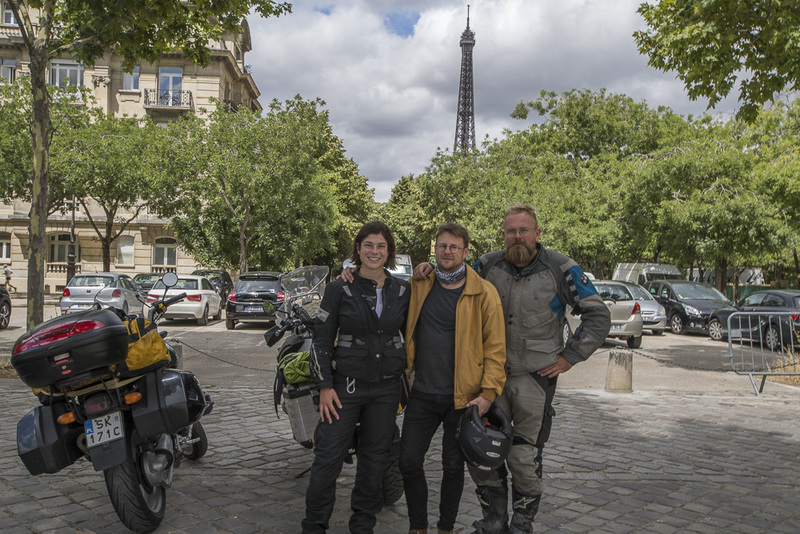 What a contrast to a month previous… we found ourselves in Geneva, by the banks of the Rhone, soaking up the sun in our, by this point, dirty and dusty motorbike clothes. Wearing our best t-shirts (the ones with the least holes and stains in) we felt we fitted in reasonably with the well heeled surroundings. The waiter who brought us our luxurious movenpick ice cream was courteous despite our scruffy appearance, perhaps used to the eccentricities of travelers. The ice-cream was heavenly- caramelised walnuts and rich chocolate which after having zero ice-cream since began time immemorial, was just so decadent we couldn’t talk whilst eating. 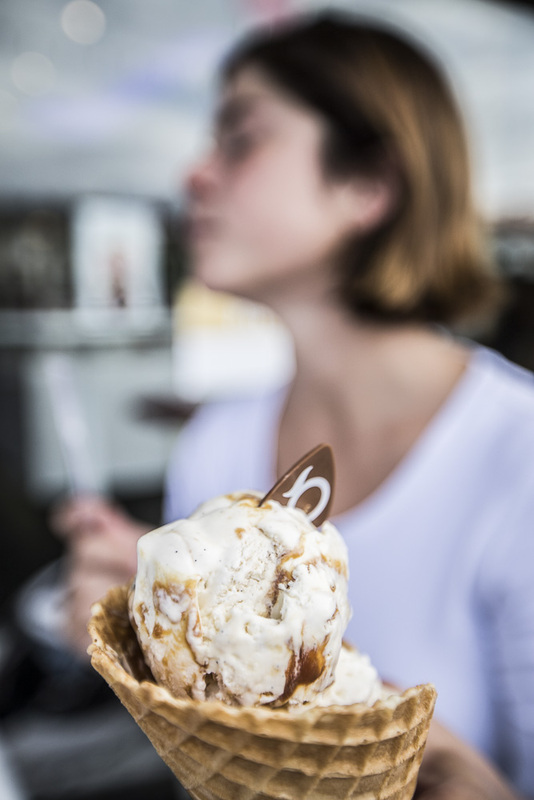 The price of a simple ice cream reflected the opulence of the area. £14 an ice-cream!! Geneva is certainly not for the budget adventurer, particularly for treats! 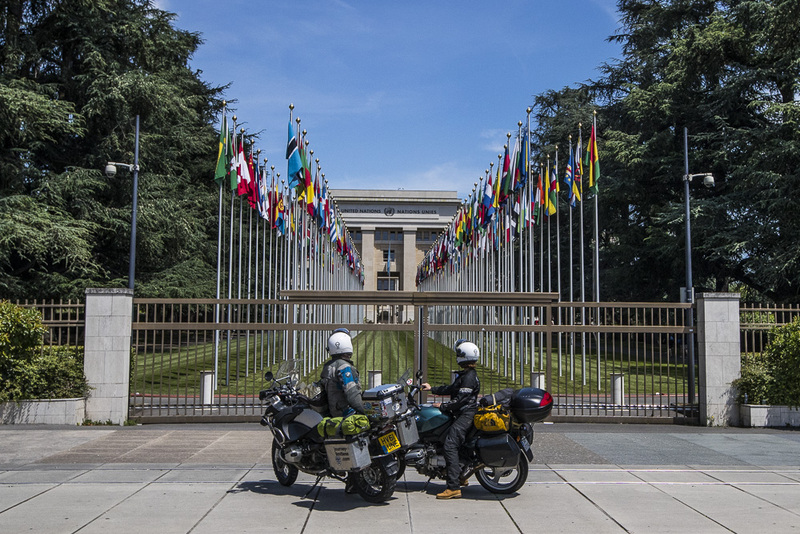 Not letting the hefty bill dent the pleasure of the ice-cream, we rode on to the UN convention center. Our journey around the world had made us appreciate the level of peace and privilege the majority of Europeans have. This is echoed by the ethos of the UN who represent (despite some faults) a noble dream as a peacekeeping force and a sense of unity which is missing from the world currently. Filled with renewed love for our global family, we celebrated with a kiss! 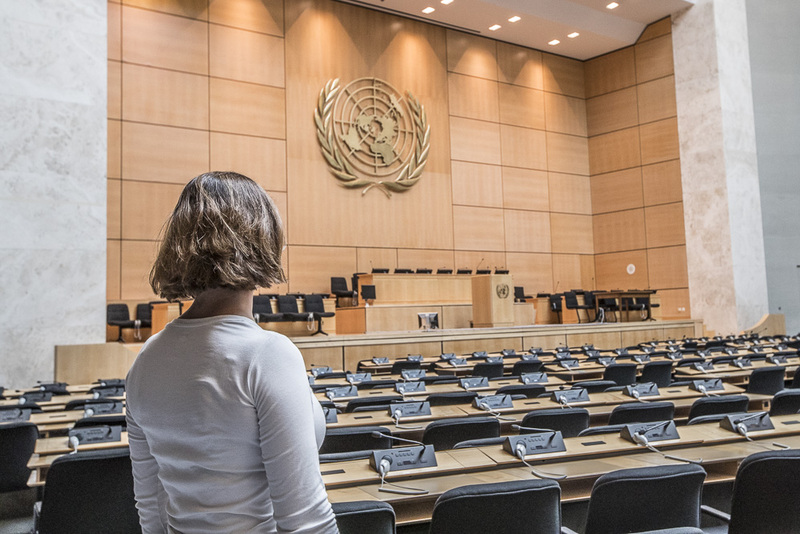 We visited the hall itself, aware that our impact is minute compared to the decisions made here. After a walk around the grounds, and a chiding from the security officers about parking our bikes too close to the centre, it was time to move on. Not before an obligatory shot of the bikes in front of the famous flags… we escaped a chiding this time, probably because we were on the right side of the fence! We rode on through the rain to the Vosges, admiring the change in landscape as the new craggy mountains gave way to the rolling ancient pine covered mountains of the Vosges. Eventually making it late in the evening to Alex’s aunt’s house and a relaxing evening, wondering why time moved so quickly when there were only hours left until being back in the UK. The next day brought an uneventful ride to the outskirts of Paris but what a homecoming!! 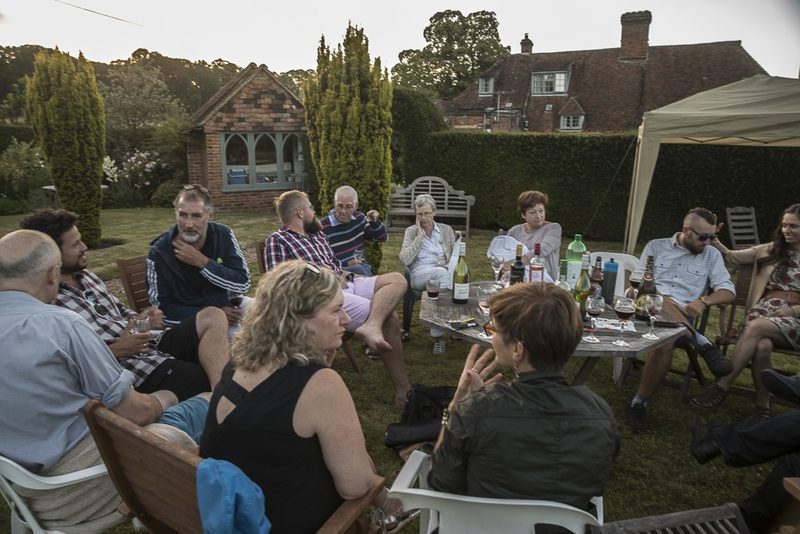 We stayed with family friends who welcomed us with champagne and a private recital from their violinist neighbour. We were really touched by such a welcome and other than the hired motorbike being low on oil and almost scuppering our prompt departure, the downsides to an old motorbike! A quick top up and we were off. Unhappily for Alex, through Paris itself, which, with its kamikaze drivers who run red lights, swerve in close and generally create mayhem with an attitude of “bof!” makes it a stressful environment, particularly when en route to Dunkerque for a ferry! Nevertheless, we stopped to view the Eiffel tower. The proximity to the Independence day fireworks meant that bollards and walls had been constructed and blocked our access. We still managed to get a distant snap! Surviving central Paris, we rode north through throngs of camps and displaced people on the main road out of town. The motorway slip rod edges and underpasses were filled with sleeping bags, trolleys, people, life, the colourful unwanted mass of people who ventured onto the road from time to time, making it a hectic place to be going at high speeds. Stopping for a quick lunch once out of this precarious shanty town, we noted a very tight deadline to catch our ferry. Even for motorbikes, passing through Parisian traffic is a challenge. Quiet now, and mostly subdued, we arrived in Dunkerque- visions of more displaced people hurrying down grassy banks around the motorway, hiding in bushes near truck stops, waiting for a potentially fatal ride to better chances. This sombre reminder as to how lucky we are to have powerful passports, good opportunities and to not be that desperate just from our geographical fortune settled on us and we thanked our lucky stars that we weren’t waiting to hitch a ride on a wheel arch, instead boldly riding up to a ferry entrance and awaiting our turn to load. 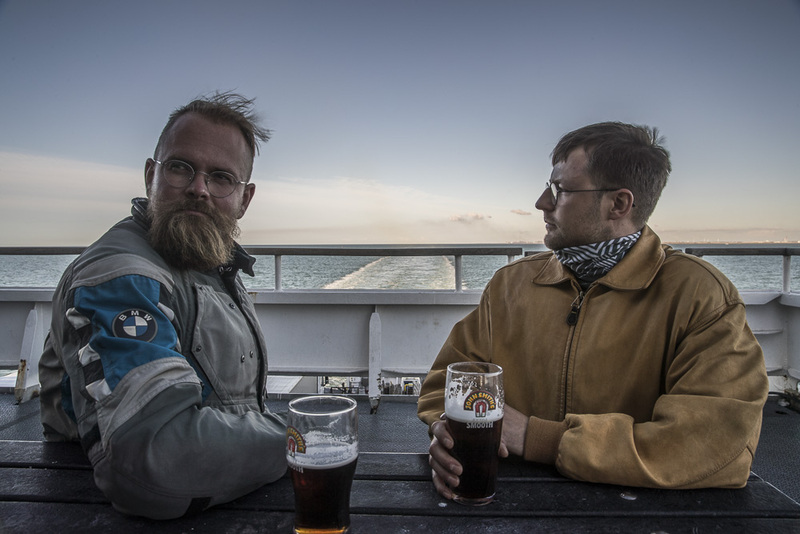 Feeling pretty deflated after a whirlwind month and bone tried from the non stop journey from Pakistan a mere 3.5 weeks previously, we relaxed a small beer on deck, watching the dull grey of the sea carrying us back to the UK. At least the sunset was pretty and it reminded us of all the limitless horizons it had been painted across during our last year. Our minds were still in journey mode when we got back but finally we reunited with long lost friends and we tried to settle back into normalcy, conversations about things other than travel, cultural differences, visa restrictions and motorbikes! Surprisingly difficult when it’s all you’ve known for a year. Similarly, we found it hard to be apart, having depended on each wholly and solely for a year. Helen, Alex’s Godmother kindly threw a welcome home/engagement party to mark our return and it was such a contrast to be in a timeless place with no deadlines to push for, no visa forms to fill! Despite missing the road immensely and the routine we’d gotten used to, it was wonderful to just float around and catch up with our friends. This dream-like evening was a fitting end to a year which was already fading into distant memory, parts of the story receding fast as we appreciated every moment of comfort but missed every second of adventure. New horizons would be limited to a few times per year rather than a daily treat. It made it such an abrupt jolt back to reality to wake up in the same spot every day. We had an adjustment period of a few weeks, if not months, to get over that initial stress of being back in a responsible, demanding life. Just the daily grind requires an ability to multitask which we hadn’t used since leaving. Some time on… we miss the road terribly, the linear thought process, the daily survival, the gift of new scenery, new people. We heard of bad news from far flung places across the world which had been home for a little while. Recognising the devastation such a moment would cause thanks to our immersion in the culture and the landscape. The journey made the world so much smaller and yet the distances were so vast that it almost typified the paradox of the whole project. Simultaneously an eternity and a heartbeat, a dream and an almost fatal reality, an immeasurable breadth and tiny, like home. We fell in love with the world through our journey, and found part of our old life, like comfortable but worn slippers, to be easy to put on but also to recognise it’s time to discard them and do something new. In the time we have been back, Alex has been offered a job role in Africa which she has accepted. The new adventure will begin!